The Edlers at Emmaus: Do we really know better? I was hoping to write a quick post as soon as were arrived back saying....were back! However things were a little more complicated so I'll share the story because there is a good point to the whole story. 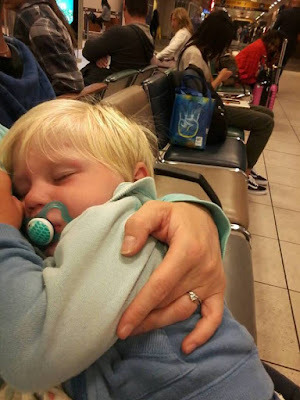 We left Karl and Beckie's house at 10 pm on Monday night, my plan was to keep the boys awake until we got to the airport so they could go straight to sleep on the plane. 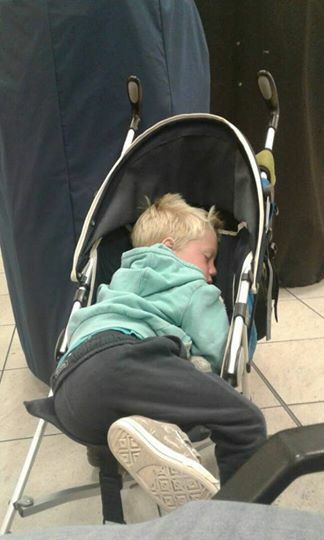 Sam couldn't handle it and fell asleep on the sofa at 9pm and stayed asleep as he got lifted into the car, our of the car then into the buggy. We checked in and by the time we got to security Joel was out of it!! Sam was then lifted out of the buggy, carried through security, back to the buggy, carried onto the plane into his seat and didn't open his eyes once, it was perfect. Both the boys slept the whole fight to Toronto. We were about 45 minutes late leaving Calgary which didn't give us much time to make our connection in Toronto. So we walked fast and had to go through American immigration in Toronto and because of the kids (travelling with children does have its benefits sometimes!!) we were let into a line where we didn't have to queue up (it was a very long queue and there would have been no way we would have made our flight). We sat down on the plane with 10 minutes to spare and we kept sitting. First we were waiting for other passengers who were stuck in immigration because of the long queue. Then there was debris on the wing, then the thing (I don't remember the technical name for it) which catches the debris was actually broken so maintenance had to come and fix it. So instead of leaving Toronto at 8.15am we left at 10.30am. The boys went back to sleep after some breakfast of fruit snacks, goldfish crackers and m&m's!! We were pretty sure we would miss the Haiti flight, so we looked at our options to make a plan. Our flight to Haiti was a separate booking so this meant buying new tickets. We got online, $2000 US for us all to fly in on Wednesday. If the boys and I made it with no bags, it would cost Bill $615 plus about $400 for his extra 3 bags and 2 car seats. What about Port au Prince, what about MFI, what about the 7lbs of cheese and 2 lbs of butter in our cool bag?? (this is important when flying to Haiti!!). We decided Bill would get straight off, run to get our bags and I would take the boys to the check in desk, check in and meet Bill with the bags and hopefully we would get on the flight. We landed in the opposite end of the airport, I got to the check in desk 10 minutes before it closed and was not allowed to check in without bags, I was told 'come back when you have your bags, you have 5 minutes'. Ten minutes later Bill arrived with our 4 suitcases, 2 carseats and 2 hand luggage bags.....poor guy!! Needless to say we didn't get the flight. It was now 3pm Tuesday, we had been awake since 7am on Monday and had all had fruit snacks, cereal bars and M&M's for breakfast and lunch! It sounds like a disaster and felt like one too but you know, God is in control of everything. All I could think was this is going to cost us so much money to try and get back to Haiti, literally $2000, plus a hotel, plus dinner, plus breakfast, plus lunch!! We went to American Airlines, the lady was helpful and even though we did not book on the same ticket and it was not American Airlines fault we missed our flight the lady put us on Stand by for Wednesday's flight for FREE. Now I didn't feel so bad. Next task, find somewhere to stay. That was pretty easy so we booked a holiday inn, had dinner in Denny's where kids ate free on Tuesdays, saving a bit more money! Me and Joel had to fish our PJ's out of the dirty washing bag and we all went to bed at 8pm. I went online for a few minutes before going to sleep and ready Stacey's fb status ' We have been on the plane for Cap and unable to land, so landed in the DR and are now flying back to Miami.' That was the flight we were supposed to be on, I think by that stage we would have lost it. I said to Bill earlier in the day ' God must have a reason for us not getting that flight today.' and here it was. Not only did they land back in Miami at 8pm, they then had to go through customs, immigration, baggage reclaim and queue up to get hotel vouchers leaving them arriving at their hotel at midnight. You can read Stacey's story here, Stacey's story also gives another reason why it would have been awful for us to be on the plane to Haiti and to arrive at the right time, it's an amazing end and lesson of God's grace and providence in our lives. We always think we know better, but we don't. Getting on that flight would have been awful, it was awful for everyone on board, but I especially wouldn't have fancied it after leaving Calgary at midnight the night before. Anyway, we re packed, back to the airport to check in. The flight for Cap Leaves at 2.45pm and we were told if there is a seat you will be called. At 2.25pm Bill was called over, there are two seats on the plane. So we asked a few questions, our bags would all go to Cap today, tomorrow's flight was already overbooked. We decided the best thing to do would be for me and the boys to get on the flight and somehow get our stuff at the other end and leave Bill for tomorrow's flight. 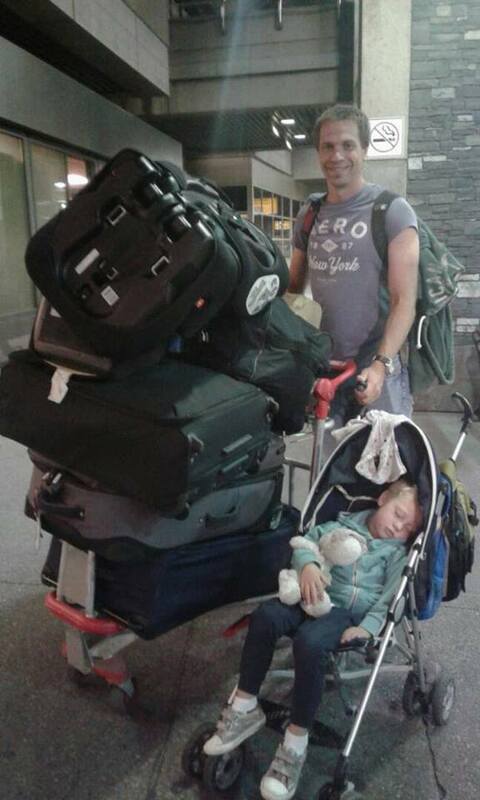 Getting on a flight with the boys, 3 bags and a buggy is not easy!! This is what I would have been picking up in Cap Haitian, minus Bill, plus Joel!! I was sitting wondering how I would ever get our stuff at the other end as no one is allowed in the airport to help you. I looked up and Bill had got on the plane, he got the very last seat! The guy next to me was moved to first class and Bill got a seat with 5 minutes to go until take off. We arrived back at the EBS compound around 7, minus two of our bags which means another trip to the airport today but its much better than none or some of us being here. We know God is always in control, sometimes things happen which annoy us or make us angry, this was one of those times, but this time we got to see why. And were so thankful that we didn't make that flight, or that the flight didn't land in Haiti because if everything had gone the way we had planned it, things would be very very different right now. Thank you for your prayers as we travelled, God certainly kept us safe and took us on the right flight at just the right time.